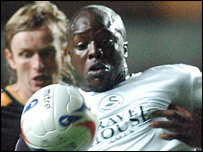 Swansea City striker Adebayo Akinfenwa could be out for two months because of a stress fracture in his left shin. The 24-year-old was hampered by the same problem in his right shin last season, but Swansea deny the injury is related to Akinfenwa's size. "People think Bayo is still too heavy, but he has lost a great deal of weight," said Swansea physio Richie Evans. "He's gone from 17st to 16st, dropping four per cent body fat in the process." Evans believes changing Akinfenwa's diet could help cure the reoccurring problem.